Note: For the latest information on Mount Pleasant please visit the Residents Association Mount Pleasant (RAMP) website at rampvancouver.com. Notice: CityHallWatch.ca is supporting a citizen’s forum on April 27 on the tower development proposal in Mt Pleasant. A public Open House was held at Heritage Hall (3102 Main St) on Tues April 12, 2011 from 4pm-9pm on a proposal to change height restrictions in Mt Pleasant that would allow skyscrapers to come to Main & Broadway. The best summary of the Council discussion on this Plan was by Jessica Barrett, in WE. On November 4 Vancouver City Council adopted a motion by Clr Andrea Reimer regarding community planning processes, proposing that City staff look into the possibility of applying the “Community Plan” process to not just one but up to three neighbourhoods at a time. Mount Pleasant is at the end of this process, which in this case took input from thousands of residents at about 50 meetings, over about 4 years, and probably cost about a million dollars of taxpayers’ money. 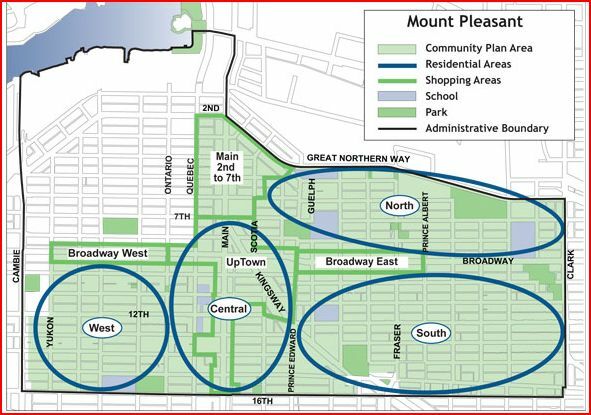 Before starting upon the path of a new “Community Plan” Vancouver would be wise to look at the achievements and lessons learned from Mount Pleasant. On this web page, CityHallWatch will do its best to provide readers with the critical info and resources to develop a balanced assessment of the Community Plan process as applied there, and lessons learned for the next such effort in our civic society. What were its costs? What did it achieve? How do residents feel about it? What lessons were learned? How do our public servants (elected and employed) at City Hall balance neighbourhood priorities with city-wide policies such as “eco-density,” Short-Term Incentives for Rental housing (STIR) and so on? Do certain city-wide policies need to be reviewed by a new Vancouver council after 2011, and should they be up for discussion during election year? If so, which ones are most problematic? The official City webpages for this process are here: www.vancouver.ca/mountpleasant. Worth special attention are the pages about the terms of reference, the history, and the outcomes. The staff report for the Nov 18 Council meeting is expected to be made public any day now. We will ask for citizen reviews of the report as soon as it comes out. Too high a high-rise? 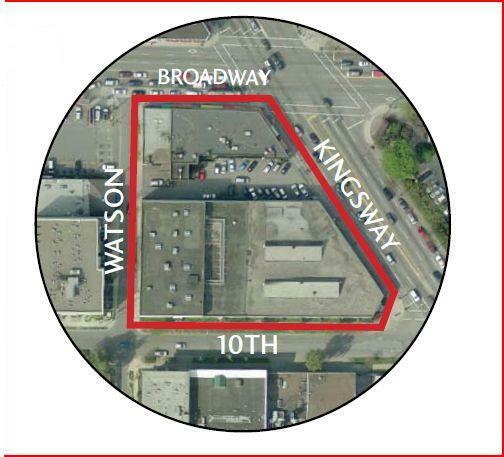 (Jessica Barrett, WE, 3-Nov-2010) A fire-razed block at the intersection of Broadway and Kingsway may become the site of a large mixed-use complex that would include a 26-storey residential tower….Rize Alliance Properties … has submitted a rezoning application … seeking permission to build a substantial development that will encompass the entire block of Kingsway and Broadway, extending to 10th Avenue to the north and Watson Street to the west….The rental units would allow the application to be considered under the City’s Short Term Incentives for Rental (STIR) program….The height and bulk of the project would be a dramatic departure from much of the rest of Mount Pleasant, an area largely made up of heritage buildings, low-rise walk-ups, and infill….But one Mount Pleasant resident involved in the community consultation process says the developer should have initiated a dialogue with community members years ago…. Read full article here. From UrbDeZine, a well-respected, independent urban design magazine, these planning principles are as taught in most design schools around the world, but the real question for Vancouver is whether they make sense to us, the residents of Vancouver, who are the primary stakeholders and funders of this city. Note especially Duany and Plater-Zyberk’s call for self-governing neighbourhoods. Bold is added for emphasis. 6) Build cities and towns for pedestrians and human scale – the drivers will find a way to get there. 9) Incorporate rather than create the topography. 10) Most planning principles that create livable communities are counter-intuitive. Based on the human mind not efficiency. Most of the dwellings are within a five-minute walk of the center, an average of roughly 1/4 mile or 1,320 feet (0.4 km). There are a variety of dwelling types — usually houses, rowhouses, and apartments — so that younger and older people, singles, and families, the poor, and the wealthy may find places to live. This section contains content from Wikipedia:New Urbanism, licensed under GFDL. Thanks for all the info CityHall Watch! How about including a link on this page to the April 27th Citizens Forum?